Watching the tea time news one night in the mid 1980’s I saw something that seemed incredible, unbelievable and it wasn’t Jan Leeming’s frizzy perm or her outrageous shoulder pads. Scary sounding winds had lifted tonnes of sand from the Sahara desert up to the high atmosphere in a huge sandstorm. From Africa it had been blown out towards the Atlanticwhere it had bumped into some moist south westerly winds heading in our direction. The sand was mixing into the raindrops before falling to earth then, after the water evaporated, it would leave a sandy deposit on surfaces such as car bodywork and windscreens etc. The big news was that it was about to drop on us overnight. Sand from the Sahara desert on our car? Wow! When you are 7 years old and the north of Scotland is as far as you have travelled on this planet that is seriously cool. Actual Saharan sand on our car! The next morning I was up and dressed early. My parents might have thought I’d had some kind of educational epiphany and decided I liked school after all, but no I wanted to see the sand from far away. And there it was, on the bonnet and the front windscreen, just like the news story said it would be. The Ford Orion in Maritime Blue looking like a dusty antique. The sand was in little uneven, imperfect circles. Left behind like fossilised raindrops, a reminder of the water that carried it here. I rubbed some of it off (thinking about it now that probably wasn’t so good for the paintwork!) and held some sand from an African desert. Cool. With my finger I wrote my name in Saharan sand on the boot lid before we embarked on the school run. The British summer conspired against me and by the time I was picked up some dirt-free rain had washed the car clean again. The sand may have been transient, but the memory has remained. 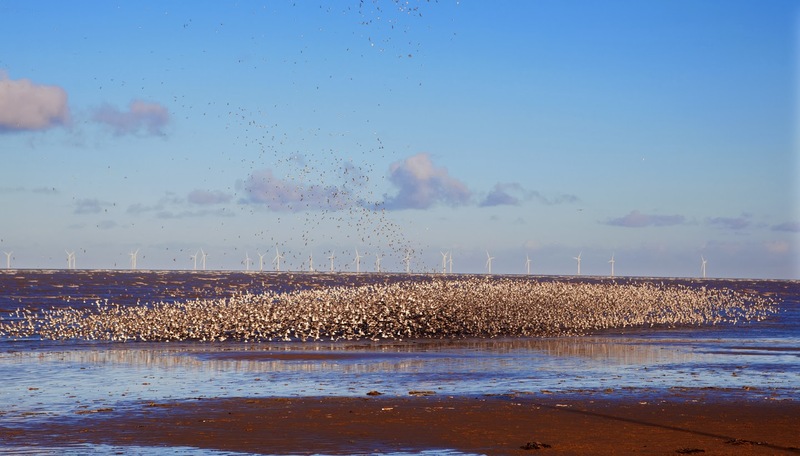 When I see big flocks of shorebirds swirling around over the mudflats or think about them high above us, far from view on their huge migration flights, I always think of them being like tiny grains of sand being blown by the winds. Like my Saharan sand. 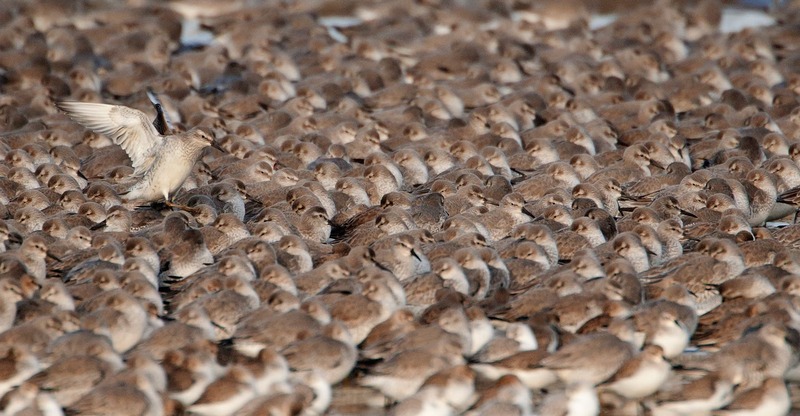 I am standing waiting for a flock of Knot on the shores of Porsangerfjord in northern Norway. Three flights and a four hour drive have brought me here and I seem to have beaten the Knots to their staging post. When they arrive they will feed like crazy before embarking on a marathon flight over open ocean to Greenland and the far reaches of the Canadian arctic. The Knots are due. The winds from the German WaddenSea have gone southerly and the birds will use this favourable air flow to speed their journey north. So we wait. Redshanks and Bar-tailed Godwits are displaying on the marsh at the south end of the fjord. 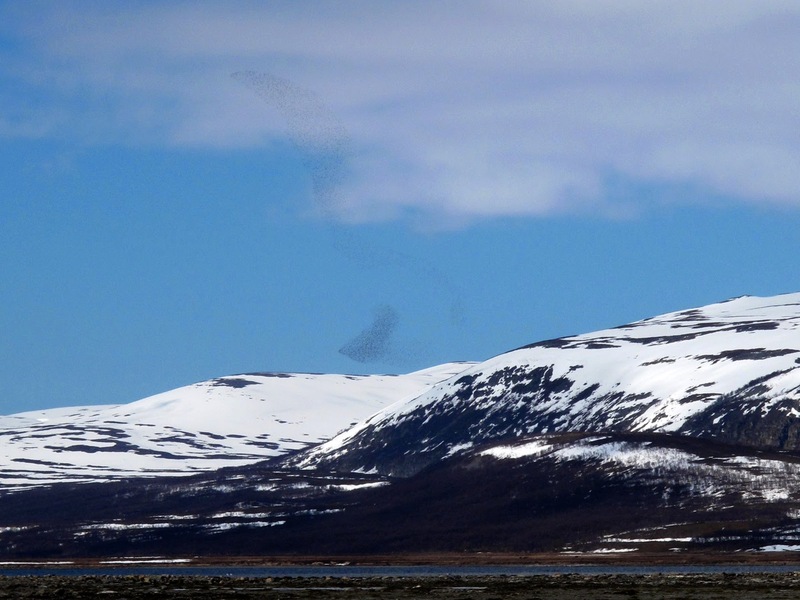 A Sea Eagle beats huge wings and lazily flies from one side of the fjord to the other. They come from the clouds, fluffy, classic cotton wool clouds. A few tiny specks appear, like…. grains of sand. More and more follow, returning to terra firma in a loose spiral. In a matter of hours they have made the huge flight over much of northern Europe and here they are. It is one of the most incredible sights I have ever seen. As I look through my binoculars I realise my heart is pounding, I have goose bumps and a smile is cutting my face in two. More and more tumble out of the clouds and drift to earth like the sand from far away. The migration I have heard and read about is now visible, it is no longer theoretical, no longer an picture imagined – I can see it. It is happening right before my eyes and it is inspiring, humbling and overwhelming. The Knots that I last saw on the Dee have been coloured in, they have changed from muted greys to bright brick red. I am snapped from my daydream by a birdwatcher calling“Sparrowhawk”. 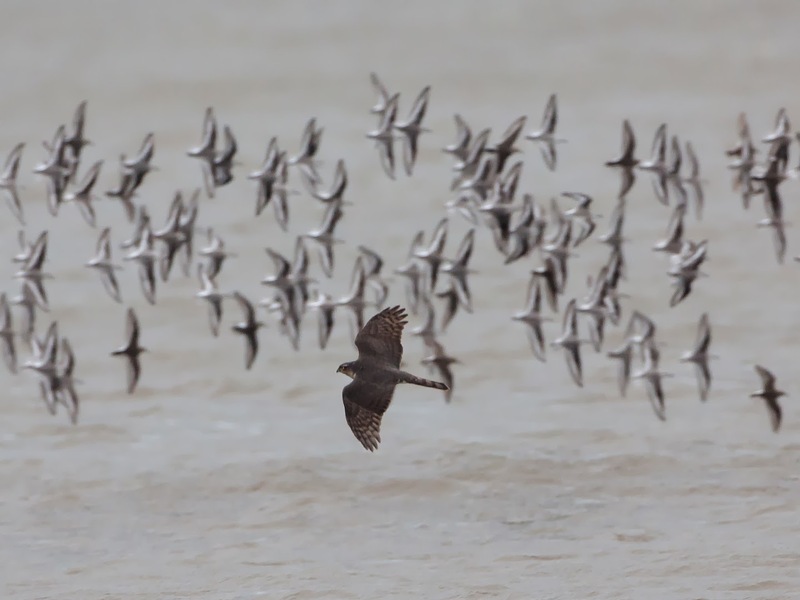 The flock is one step ahead of observers and the raptor and they catapult themselves from the beach into frantic aerial manoeuvres. They go zigging left and zagging right, going out over the choppy tide. The Sparrowhawk will only follow them a short distance over the open water and it soon returns empty-taloned and disappears over a garden fence. While the birds are out of range of my camera for pictures and my‘scope for colour ring sightings I drift off on another daydream. 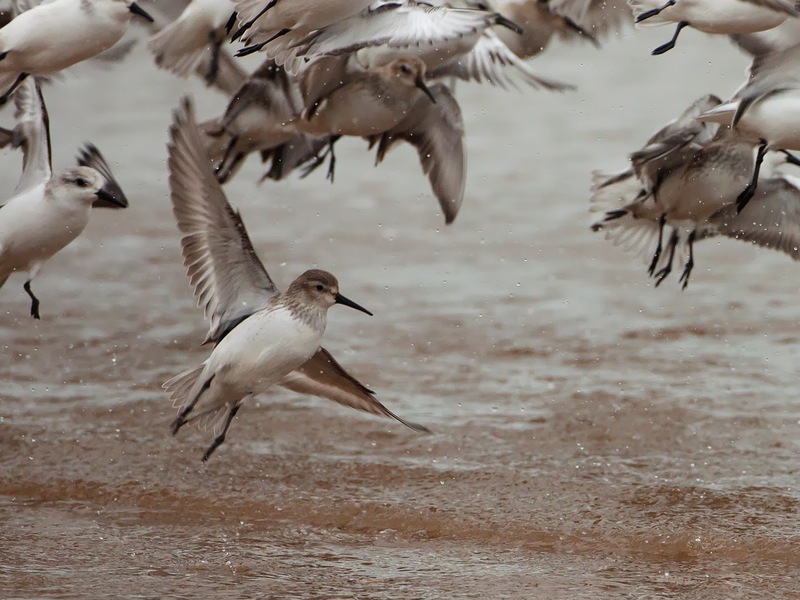 I do a lot of thinking when I watch shorebirds. It can often be quite a solitary occupation, just me, the birds and my camera. I have all sorts of ideas and thoughts on the mudflats, like remembering the sand from far away. The flock is well and truly spooked and never returns to the shore. 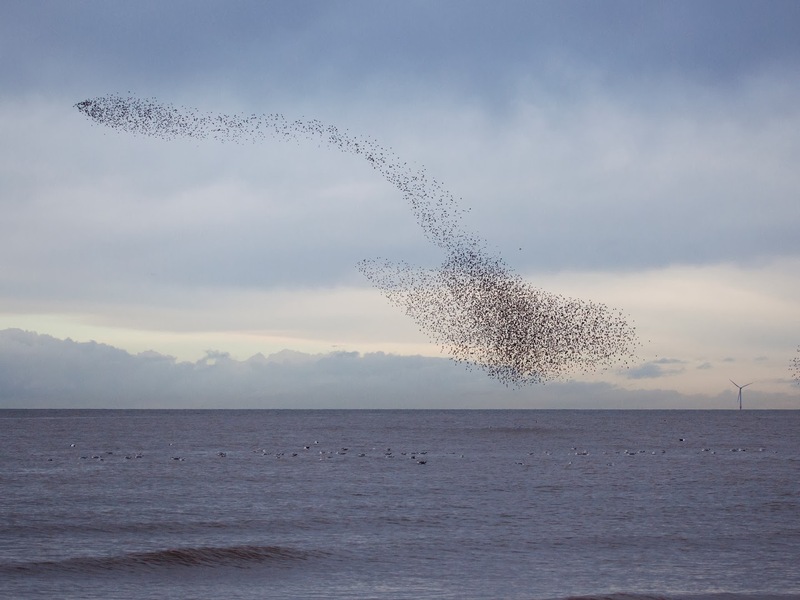 They fly out the remainder of the high tide, circling around Hoylake, high up one second then low over the waves the next. They form into weird and wonderful shapes, at one stage looking like a huge CGI-ed manta ray about to dive into the water. The twisting and turning continues as they disappear away into the distance like a sandstorm. A Sandstorm made of the sand from far away. Great pics of epic natural phenomenon right on Hoylake beach!